Rules of Engagement– Whatever tenuous rules and policies I’ve made for the moment and will change or abandon at will. Troop management– Getting to school, through IKEA, church, or Costco with all members accounted for, unbloodied, and almost on time. Group Cohesion– Tying everyone’s performance to everyone’s reward. While strongly protested as unfair, it has proved an effective tool for building cohesion and accomplishing missions. The Enemy– Colic, TV, exhaustion, or an opposing faction within a family usually consisting of barefoot short people. Guerilla Tactics– Sneaky goings on: Throwing away [read: donating] unused toys when children aren’t around. Putting mushrooms through the garlic press, so the kids can’t pick them out. Changing their clock so we can sleep in for another 30 minutes. Surrender– My flag waving arm is sore and it isn’t because I’m such a patriot. Routing– What happened to me last Saturday when Hot Swede was gone all day, ending with friends’ pity and their bringing me wine. Trench Warfare– The parenting of very young children. Consistently interrupted sleep, chaos and destruction coming at you from all directions all the time and all you really want is a pair of dry socks. Night Watch– What the stay at home parent gets when a child has nighttime vomiting, ostensibly because I “can sleep during the day.” Bwah ha ha ha. Recon– going through the backpack, looking for a permission form. Special Ops– Volunteering, attending, being over age 30 at the school carnival, teaching Sunday school, leading a boy scout troop, etc. Victory– If Hot Swede and I make it to 51 and they make it to 20 nearly whole, good, functional, and still smiling at each other, we will have a ticker tape parade. 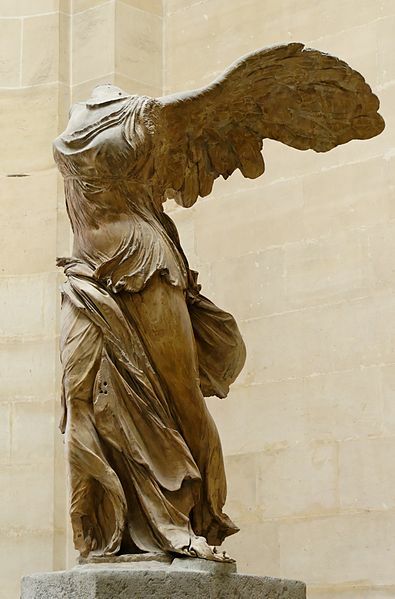 Winged Victory: If she kept her head, it wouldn’t be as fitting. This entry was posted in Growing People, Life Maintenance, Uncategorized and tagged behavior, childhood, Children, family, home, Kids, motherhood, parents, rant.